Dr. Tourgeman, Mr. Billy E (from Nephro-paleo) and many others subscribe to an evolutionary (revolutionary) approach for the delivery and science of medicine and reversal of neoLETHAL diseases. The failures of pharmaceutical treatments (ACCORD--diabetes treatment, STATINS S*CK AND DEBILITATE MITOCHONDRIA, etc), out of control incidence of dia-besity and exponential increases in autism, autoimmune disorders and cancer never cease to astound. Modern medicine illustrates too well where we are going wrong with a false foundation of non-functional exercise prescriptions (lack of intensity and weight bearing), high carb grain-based diets and ignorance for ancestrally cemented diurnal/circadian hormesis patterns. I've been reading, reading, reading and absorbing... Yeah... it's awful... multitasking my reading b/c I cannot choose and they are all awfully EXCELLENT. Evolutionary medicine, horticulture/PHARMING, hormones and integrative medicine have the been the topics of keen interest the last few months. Lately I've had the pleasure and oportunity to meet many other integrative practitioners. For one, last year I have had more time after going part-time working 2/days per week at a new position at an integrative medicine/BHRT compounding pharmacy. With chances to talk to integrative practitioners and patients who are ahead of the curve happening all day long, knowledge gaps are being filled in. Sometimes tales do morph to reality. Integrative medicine is where the rubber meets the road -- an interface between high and low tech; between science and folklore. We know paleo works but does it meet modern metrics? Yes naturally of course. You knew that. Is an evolutionary diet and lifestyle enough? Why not, if not? Below are a couple of abstracts from Wallace a scientist with a bend toward evolutionary medicine and special emphasis on mitochondrial medicine. Many of us including Tourgeman and I are enormous fans of mitochondria (read the seminal Nick Lane's Power, S*x, Suicide), our endocytosed bacteria what we host and cater to. Both plants and animals have mitochondria, yet only the ascent of man may be attributed to mitochondria and the efficient mitochondrial fatty oxidation of our adipose and ketones. The returns for optimal mitochondrial health are huge -- disease free longevity, happiness and efficient energy production to name just a few. The complexity of mitochondria involve physics, energy, systems biology, maternal genetics, epigenomes, membrane potentials, control of pollution (ROS), bioelectricity, ATP and the explosive, exothermic energy extraction of H2O synthesis. Wallace describes chi (ancient Chinese philosphy of energy and its flow) as mitochondria. For a Western conventionally-trained scientist, I find that to be mind-numbing and immense. If we are all from Africa, then what separates us genetically? Why do some fail on 'paleo' or 'panu' or 'OD' or 'plant avoidance' or ketosis' or 'zone' or whatever? First of all, the dynamics of hormones, toxicity, and extent of neoLETHAL damage on endocrine/GI/brains cannot be overemphasized. Outside of these obvious factors, I conjecture the remainder of genetic variations that were selected for thriving and reproduction depended on our ancestors' local microenvironmental niches, climate changes and resultant food supply. Unlike guinea pigs or lions, humans are OMNI-WH*RES... *ha* We eat anything and everything edible... EVEN HYDROGENATED TWINKIES. In Asians, once rice fermentation and alcoholic beverages evolved, so did the gene to process alcohol without toxicity (alcohol dehydrogenase, ADH1B). NY Times: Adventures in Very Recent Evolution. Mitochondrial, Y Haplotypes and other DNA variants may indeed describe our bioenergetic differences on the most basic level. Mitochondria utilize for energy production and regulation of genes/growth/reproduction many co-factors: B-vitamins, coenzyme Q10, carnitine, lipoic acid, thyroid hormone (selenium, iodine, tyrosine), etc... Some inviduals have higher B vitamin and methylation requirements whereas others are fine with virtually none? Vitamin C requirements I hypothesize might actually vary by equatorial latitude perhaps in the same fashion perhaps as vitamin D and UV B photons. Where did your ancestors and mtDNA originate from? THANK YOU GENTLEREADER, TYLER (Blog at Evolutionary Health Systems)!! 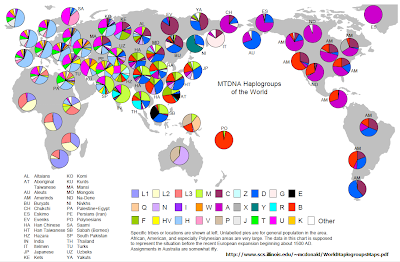 Why do we still have a maternally inherited mitochondrial DNA? 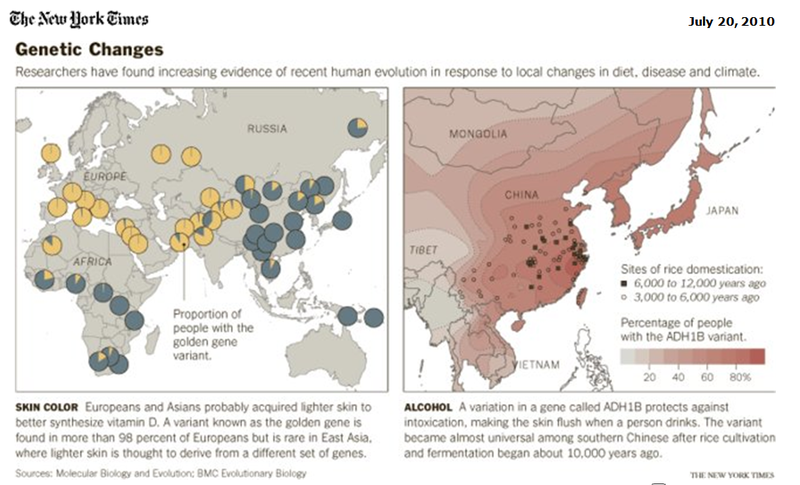 Insights from evolutionary medicine. The human cell is a symbiosis of two life forms, the nucleus-cytosol and the mitochondrion. 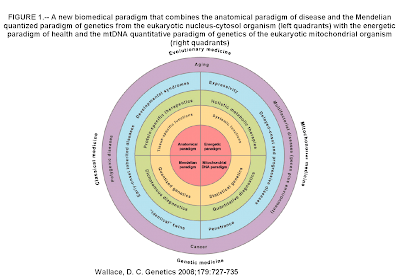 The nucleus-cytosol emphasizes structure and its genes are Mendelian, whereas the mitochondrion specializes in energy and its mitochondrial DNA (mtDNA) genes are maternal. Mitochondria oxidize calories via oxidative phosphorylation (OXPHOS) to generate a mitochondrial inner membrane proton gradient (DeltaP). DeltaP then acts as a source of potential energy to produce ATP, generate heat, regulate reactive oxygen species (ROS), and control apoptosis, etc. Interspecific comparisons of mtDNAs have revealed that the mtDNA retains a core set of electron and proton carrier genes for the proton-translocating OXPHOS complexes I, III, IV, and V. Human mtDNA analysis has revealed these genes frequently contain region-specific adaptive polymorphisms. Therefore, the mtDNA with its energy controlling genes may have been retained to permit rapid adaptation to new environments. Dev Disabil Res Rev. 2010 Jun;16(2):114-9. Extensive efforts have been directed at using genome-wide association studies (GWAS) to identify the genes responsible for common metabolic and degenerative diseases, cancer, and aging, but with limited success. While environmental factors have been evoked to explain this conundrum, the nature of these environmental factors remains unexplained. The availability of and demands for energy constitute one of the most important aspects of the environment. The flow of energy through the cell is primarily mediated by the mitochondrion, which oxidizes reducing equivalents from hydrocarbons via acetyl-CoA, NADH + H(+), and FADH(2) to generate ATP through oxidative phosphorylation (OXPHOS). The mitochondrial genome encompasses hundreds of nuclear DNA (nDNA)-encoded genes plus 37 mitochondrial DNA (mtDNA)-encoded genes. Although the mtDNA has a high mutation rate, only milder, potentially adaptive mutations are introduced into the population through female oocytes. In contrast, nDNA-encoded bioenergetic genes have a low mutation rate. However, their expression is modulated by histone phosphorylation and acetylation using mitochondrially-generated ATP and acetyl-CoA, which permits increased gene expression, growth, and reproduction when calories are abundant. Phosphorylation, acetylaton, and cellular redox state also regulate most signal transduction pathways and activities of multiple transcription factors. Thus, mtDNA mutations provide heritable and stable adaptation to regional differences while mitochondrially-mediated changes in the epigenome permit reversible modulation of gene expression in response to fluctuations in the energy environment. 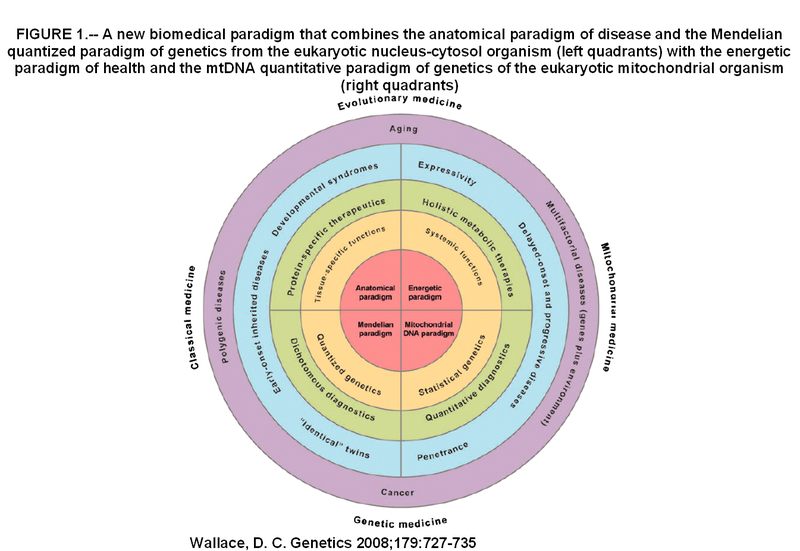 The most common genomic changes that interface with the environment and cause complex disease must, therefore, be mitochondrial and epigenomic in origin. 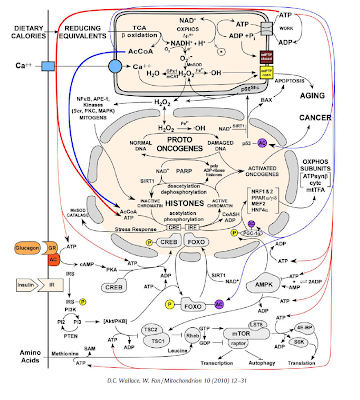 Mitochondrial dysfunction has been linked to a wide range of degenerative and metabolic diseases, cancer, and aging. All these clinical manifestations arise from the central role of bioenergetics in cell biology. Although genetic therapies are maturing as the rules of bioenergetic genetics are clarified, metabolic therapies have been ineffectual. This failure results from our limited appreciation of the role of bioenergetics as the interface between the environment and the cell. A systems approach, which, ironically, was first successfully applied over 80 years ago with the introduction of the ketogenic diet, is required. 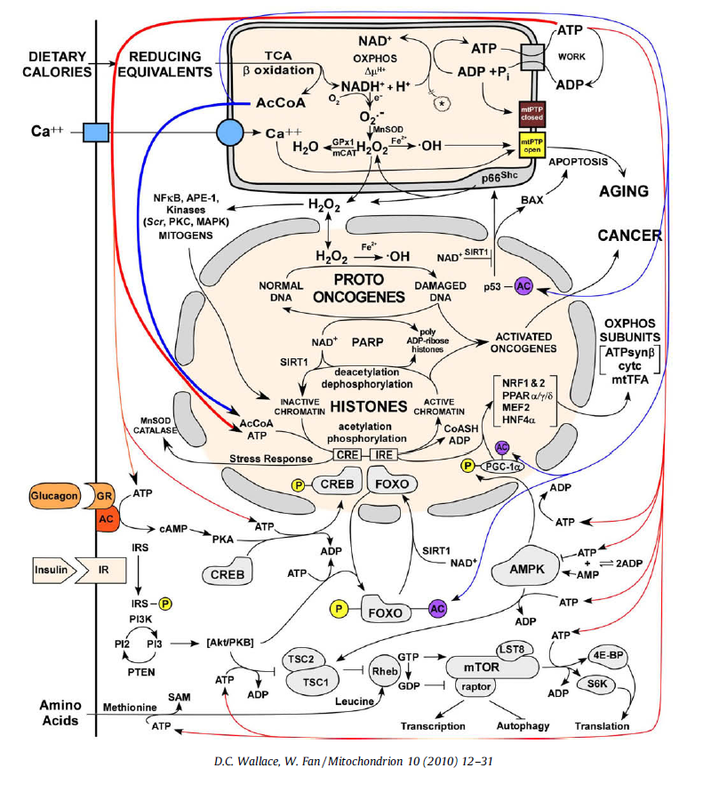 Analysis of the many ways that a shift from carbohydrate glycolytic metabolism to fatty acid and ketone oxidative metabolism may modulate metabolism, signal transduction pathways, and the epigenome gives us an appreciation of the ketogenic diet and the potential for bioenergetic therapeutics.